Assessment of academic fees is based on whether the student is registered as a graduate or undergraduate student and not the level of courses the student may be taking. 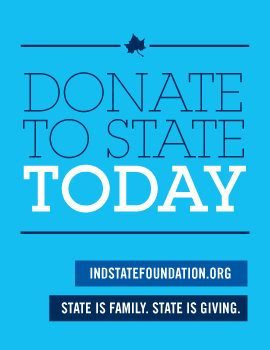 * Visit www2.indstate.edu/scholarships for eligibility requirements. Out-of-state residents are eligible for the online rates (listed below) if they are admitted to an Indiana State University online program. Out-of-state residents who do not meet these eligibility requirements will be charged out-of-state tuition. BS Nursing (LPN/LVN Completion Track) online program students will be charged full non-resident fees, effective with those admitted for Fall 2015 or later. · An online education delivery fee of $30 per undergraduate course will also be assessed to online learning courses. · Students are also charged laboratory fees, course fees, and/or applied music fees for certain classes for supplies and equipment usage, and/or special instruction/supervision. For a list, visit lab/course/program fees. · Students are required to purchase textbooks for the respective programs. · Nursing students enrolled in specific nursing courses are also charged a clinical education and faculty course fee. · A Student Recreation Center Fee will also be assessed when a student enrolls in six or more on-campus credit hours, beginning with the first fee assessment of the respective term. The assessment of the fee will be $100 per semester Fall/Spring. · A Student Recreation Center Fee will also be assessed when a student enrolls in three or more on-campus credit hours for summer, beginning with the first fee assessment of the respective term. The assessment of the fee will be $40 for the summer session.